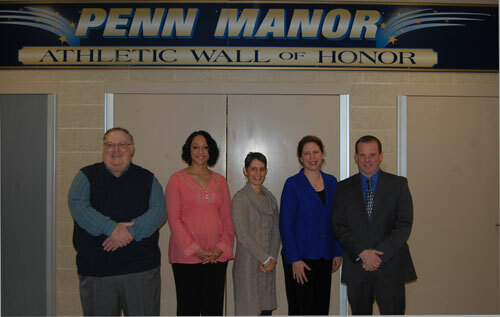 Five Penn Manor alumni were inducted into the Athletic Wall of Honor on Friday, January 4. The inductees included Lloyd Byers (1964) a three sport athlete competing in soccer, wrestling and baseball winning the Lancaster County League batting title in 1962; Kambria Riggins Rich (2002) a soccer standout who was part of the 2002 state championship team. She led the L-L League in 2002 with 31 goals; Amy Martin (1982) a four-time L-L League track champion in the 100-meter hurdles and a member of the league championship 4×100 relay team; Donna Bervinchak (1985) a three-time sectional and district champion in gymnastics winning the state championship on the parallel bars and placing second in the all-around; and Guenter Miller (1992) a member of Penn Manor’s first official swim team and a four-time all-state swimmer in the 100 butterfly. Following the induction ceremony, the athletes were honored at halftime of the boys varsity basketball game. Pictured from left: Lloyd Byers, Kambria Riggins Rich, Donna Bervinchak, Amy Martin and Guenter Miller.